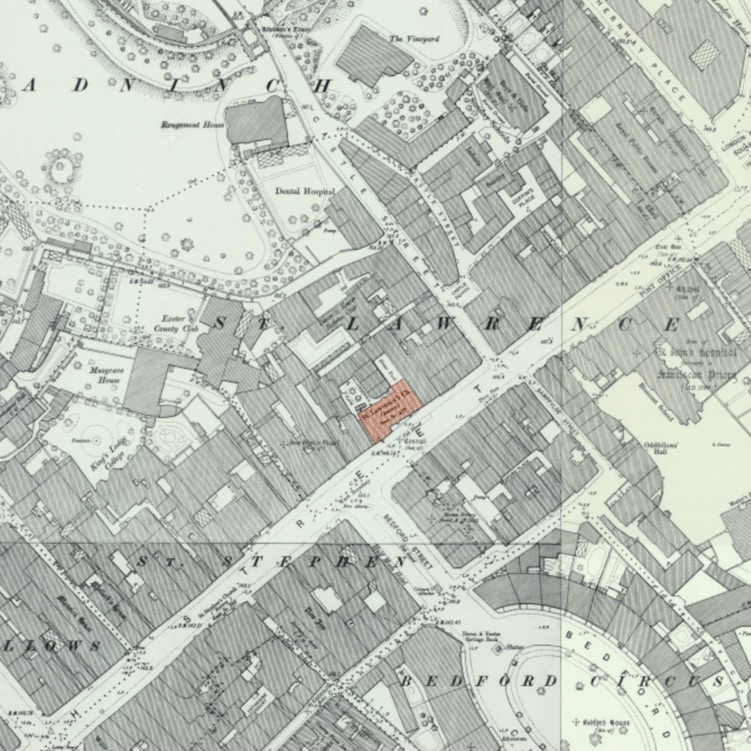 Although White's directory states it was a neat, plastered building, in 1857 the plaster was hacked off and the stone redressed, while Bath stone battlements were added to the tower and main body of the church. Early photographs of the church indicate a construction of Heavitree sandstone. 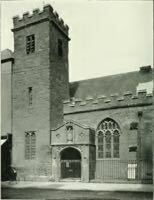 The church had a tower with a single bell, which replaced two bells which were purchased by the parishioners in 1658 for £100. They were sold in 1780 to raise funds to repair the building. Andrew Brice in the satirical Mobiad relates a humerous story of what was considered to be an odd looking tower. "A Country Boy, in company with his Mother, happening to pass by this Church, and observing the Tower, mistook it for the Chimney of the adjoining House, and exclaimed to his Parent, "Mother, Mother, what a gurt Chimbley that little House has got,""
Internally there was a chancel, nave, and a north transept. 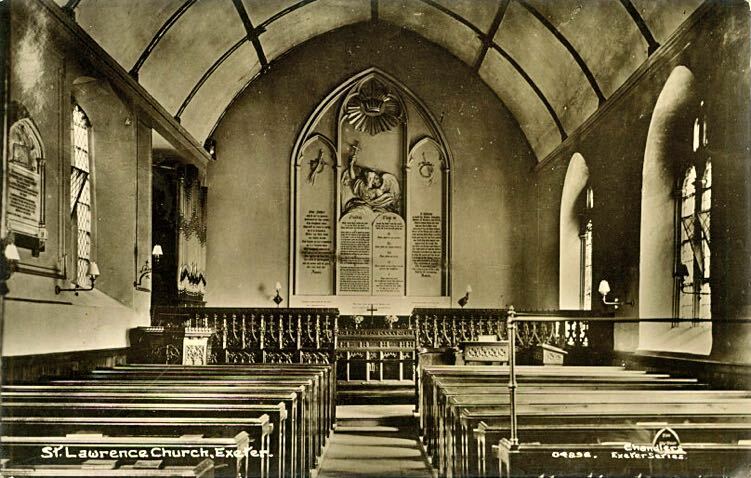 The church was repaired in 1847 when new seating for 350 installed at a cost of £600. In September 1850 the church was again reseated with carved oak pews at a cost of £550. The interior had a handsome carved oak screen and a painted altar-piece by Mr Eastment of Exeter. There were few monuments in the church, perhaps reflecting the lowly position of the worshippers in society. In 1869 a window, made by Frederick Drake, depicting Christ blessing the children, the Good Samaritan and St Peter and St John was installed in memory of Mr Richard Somers Gard MP., by his widow. 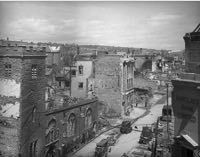 To the rear of the church was a small churchyard, formerly a garden, which was used to bury the bodies of poor parishioners for free. 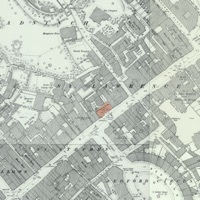 However, the Devon and Exeter Hospital surgeon Robert Patch was buried in the yard in June 1813. The register dates from 1604. 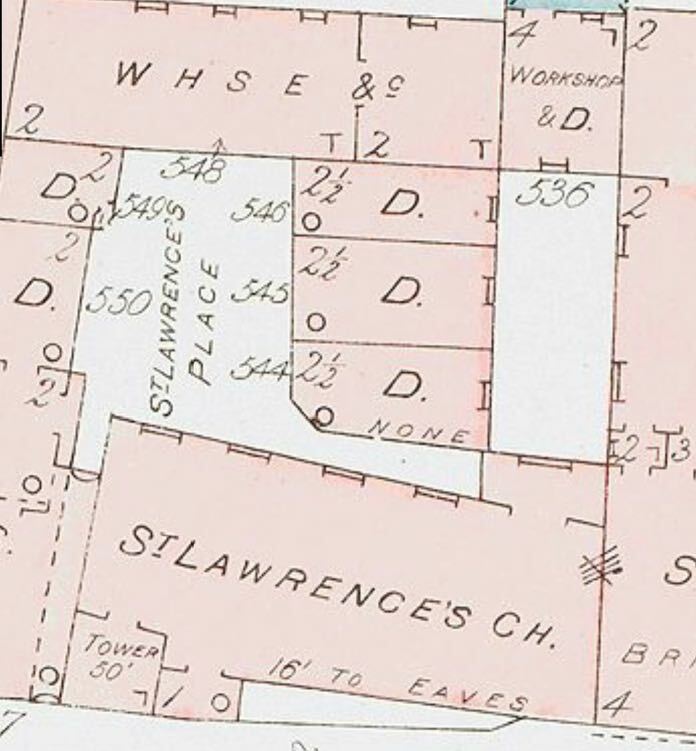 During the nineteenth-century, the roadway in front of the building was a standing area for flys (horse taxi), which was convenient for patrons of the Three Tuns public house that was directly opposite – there were several prosecutions for bad language and even fighting by the flymen outside St Lawrence, which must have been a trauma for the ladies leaving the church. Flymen were also regularly fined for leaving their horse and fly unattended, probably while they had a swift pint in the pub, rather than a prayer in the church. 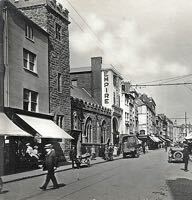 The building at the east end of the church was from 1910 to 1937 the Empire Electric Cinema which would have proved to be a greater attraction than the old church. 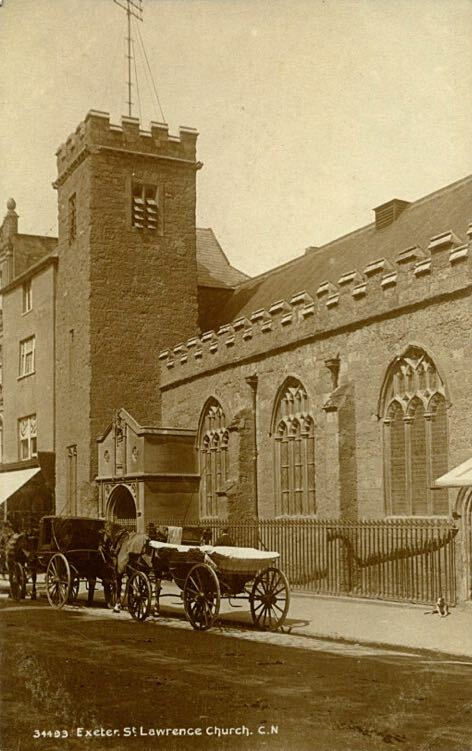 Sources: Whites 1850, Kelly's 1897, The history of the city of Exeter By George Oliver, British Newspaper Archive, Exeter Churches by Edith Cresswell..
A late 19th Century photo of St Lawrence's Church, looking west. The church looking east. 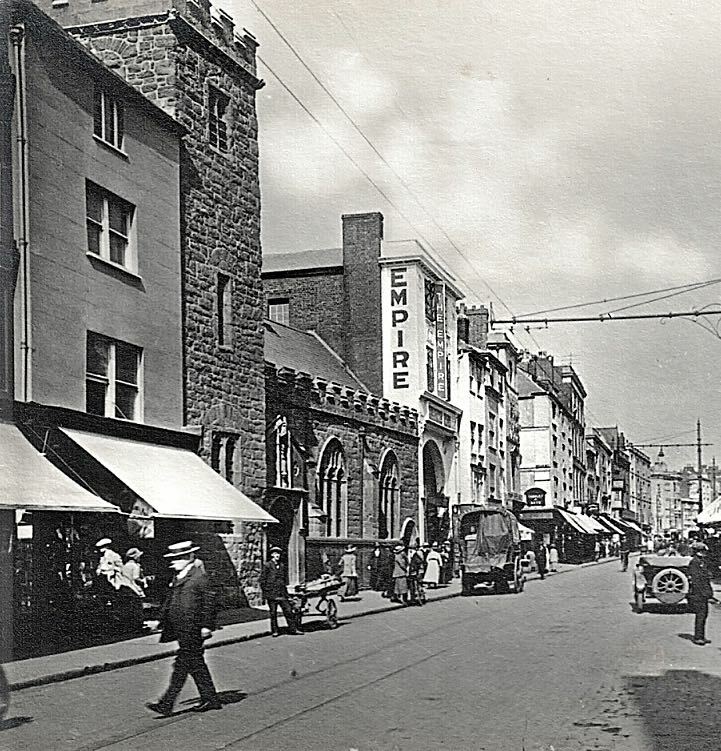 Note the Electric Empire cinema, next to the church. 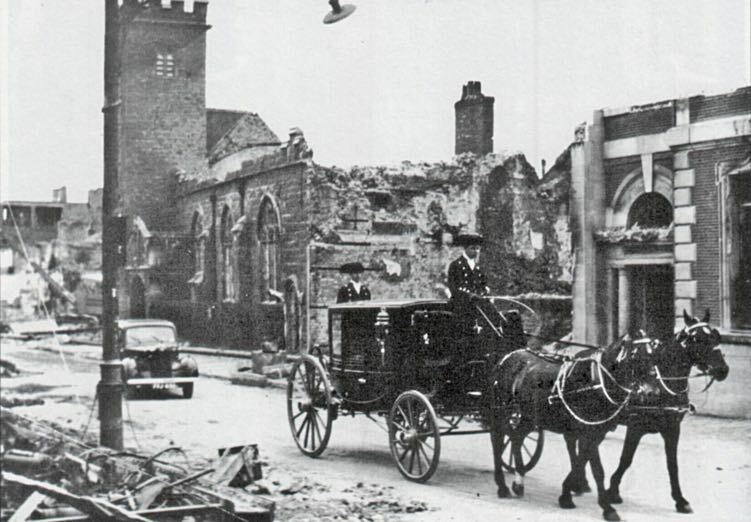 The Sheriff's Coach passes the bombed out wreck of the church, in 1942. 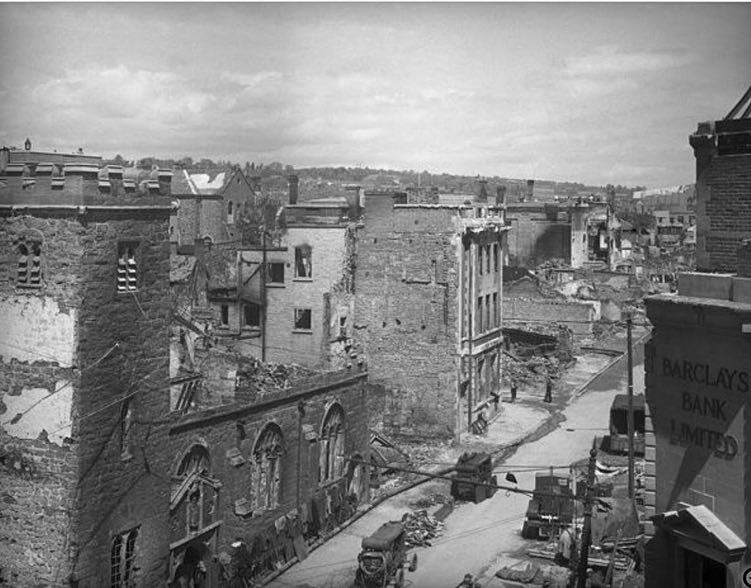 Another view of the remains of the church after the blitz. View showing the porch that was originally in the middle of the High Street, as a public water conduit. Notice the statue of Elizabeth I over the door. 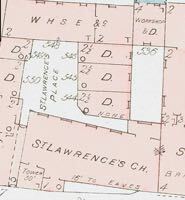 An 1890 insurance map of the church.